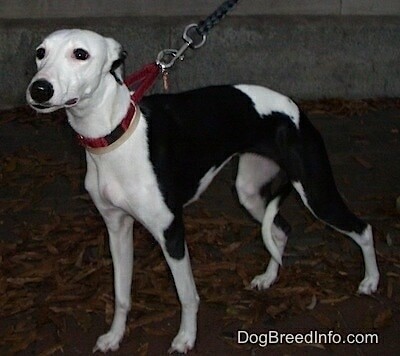 The Whippet is a medium-sized sighthound that looks similar to its cousin the Greyhound. The skull is long and lean with a fairly wide space between the ears. The muzzle is long with almost no stop, tapering to the nose. The nose is black, dark blue or dark brown, the latter two being so dark they look black. The teeth meet in a scissors bite. The small, rose ears are held back, folded and are semi-perked when they are excited. The oval-shaped eyes are dark in color. The front legs are straight and the feet are thick, either cat or hare like. The tail is long, tapering to a point. It is held low with a slight upward curve near the end, reaching to at least the hock. Dewclaws are sometimes removed. The short, smooth coat comes in all colors including brindle, black, red, fawn, tiger white or slate blue, either solid-colored or mixed. 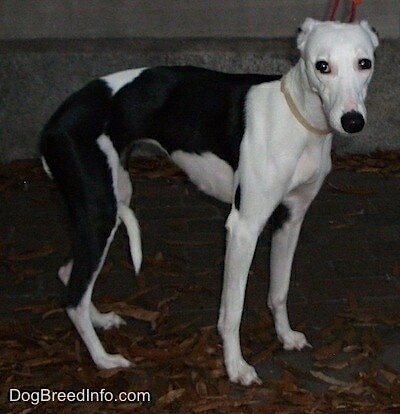 The Whippet is intelligent, lively, affectionate, sweet and docile. This very devoted companion is quiet and calm in the home. 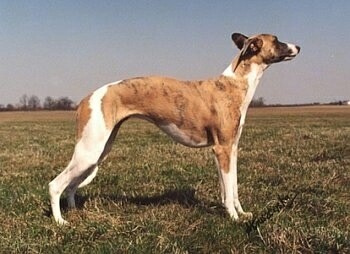 The Whippet should never be roughly trained, for it is extremely sensitive, both physically and mentally. Be sure to introduce plenty of variety during training. The best results will be achieved by including games and running. These dogs are good with children of all ages as long as the children do not roughhouse or tease the dog. Whippets are clean, virtually odor free, easy to care for and easy to travel with. They are good watchdogs and may be reserved with strangers. They will pursue and kill cats and other small animals if given the opportunity, but are good with other dogs. 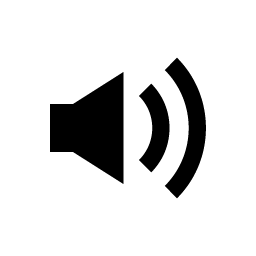 Household cats that they are raised with and have become accustom to will be left alone. They can be used to hunt. 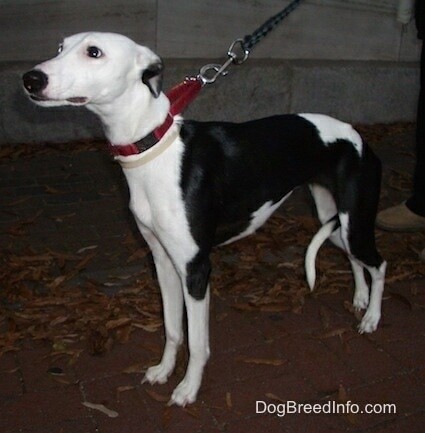 The Whippet's sweet personality makes him a fine companion dog. The Whippet is the ultimate sprinter, unsurpassed by any other breed in its ability to accelerate to top speed and to twist and turn with matchless dexterity. Some can be difficult to housebreak while others housebreak quickly. Make sure you are this dog's firm, confident, consistent pack leader to avoid Small Dog Syndrome and behavior problems. Always remember, dogs are canines, not humans. Be sure to meet their natural instincts as animals. Prone to stomach upset and skin problems. 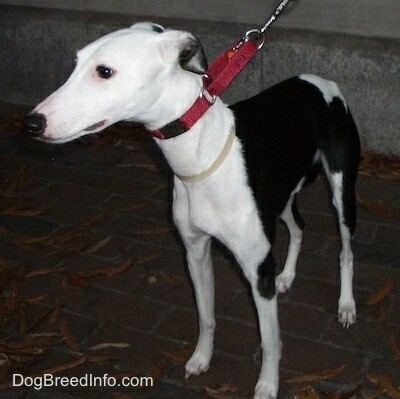 The Whippet kept as a pet should have regular opportunities to run free on open ground (in a safe area) as well as a brisk daily walk on a leash. 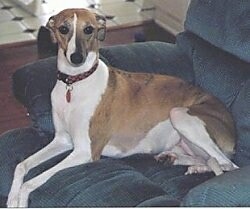 It is a sighthound and will chase and kill small animals so a fenced yard is essential. The Whippet's smooth, fine, shorthaired coat is easy to groom. A regular rub all over with a damp chamois will keep the coat gleaming. Brush with a firm bristle brush, and bathe only when necessary. The coat of the Whippet is virtually free of "doggie odor." This breed is an average shedder. 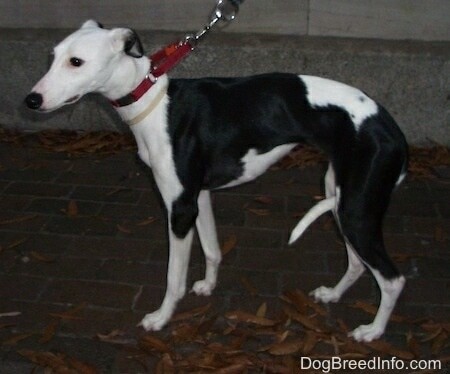 The Whippet was developed at the end of the 19th century through crossing among the Greyhound, the Italian Greyhound, and another terrier type dog. Its name derives from the expression "whip it," meaning “to move quickly.” The Whippet is an outstanding track racer over short distances, reaching speeds of up to 37 miles per hour (60 km per hour), reaching those speeds in seconds! Coursing these dogs was an entertaining form of gambling for the lower classes in England and the Whippet was nicknamed "the poor man’s racehorse." 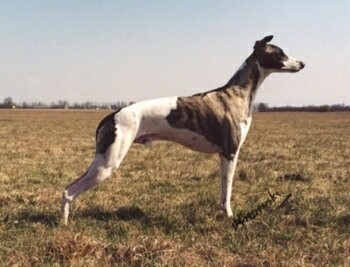 The Whippet was recognized by AKC in 1888 and by the English Kennel Club in 1891. Some of the Whippet's talents include: hunting, sighting, watchdog, racing, agility and lure coursing.